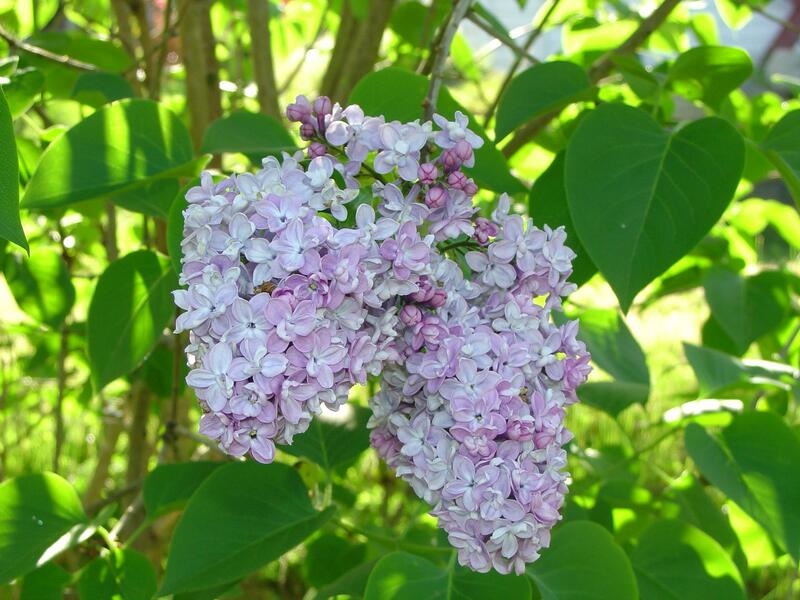 I smelled a lilac today, and I had braids, long and unruly. Along the grass they dance with me, run away wisp pushed back again, past flushed cheek tucked behind ear and silver frame for keeping glasses in place. Run wild for the fun. If spectacles hold, fine. If not, still I move. Cartwheels, they are random and daring. Never ridged with steps one, two and three. Fast I fly, my braids and me, together across the happiness of young. Mower and me, we trudge past the lilac bush… down the row and back again, back and forth we move, like days one after another, over and over, the same tasks drag, they tug me to a slow plod. Braids brushed out for years now… a color, a foil, they work to tuck away wisps, silver and stiff, but still with minds of their own. All pulled back for managing the row after row of life that won’t let up. A whim comes over me. Tugged I am, and determined – though ashamed of myself for ignoring soppy drops of rain I’d beat if I tried, mower and me, we veer away from what needs doing toward a place of bounding over the hill, leaping shrubs and stones and through a springtime fragrance, hurling self through space to land wherever leap will take me. Flowers about me, I’m wide awake, alive. Mower and me, we finally manage to part from the fragrant bush, leaving behind packaged time in blooms. Rain comes hard, running through the wispy grey, down face, I wipe it aside with muddy sweatshirt sleeve and I smile. Down under soaked and muddy middle age, an almost forgotten happy ache holds on. Almost missed completely for a task needing done. Amelia, this was beautiful and poetically written. Made me feel those braids I used to wear and I could smell those lilacs. Thank you! I remember your beauty braids, too:) You should have smelled the lilacs today. Crazy amazing! !